I’ve been so inspired by all the work Maggie does, both on her Gussy Sews website and in her Shop Gussy shop – I couldn’t help but transfer some of that inspiration into a hand-knit pattern! 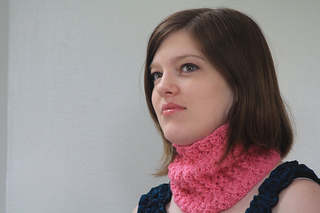 And no, this cowl doesn’t have ruffles like so many of the Gussy products do, but it nods to the femininity that Maggie brings to each of her creations, and the whimsical approach she seems to have to life in general! Knit in the round, the keyhole design is formed without the need for cabling of any kind, so a beginner knitter looking for a challenge can step right in and knock out this cowl in a day or two!